I want to ask you if it is possible to close all open orders and to delete all pending orders within a unique call to a method. 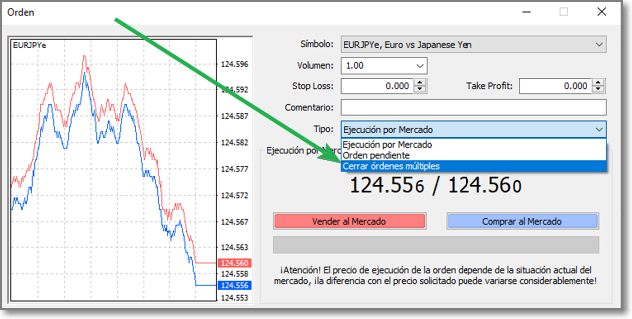 Without the need to iterate over Orders MODE_TRADES. #property copyright "Copyright © 2005, Matias Romeo." I havent explain myself properlly. I am trying to avoid to iterate over the trades in order to close/delete them. This is the sequence to close all orders in the fastest possible way. Manager EA opens worker EAs on separate charts that can receive commands from the manager for asynchronous order ops. Manager EA calculates net positions and sends commands to worker EA to async hedge each net position (if more than one order exists) or close position (if only one order exists). Manager does a multiple closeby in order to reconcile zeroed out (temporarily hedged) positions. I ll try it. Thank you!